I got an email from Northridge Publication (who I'm doing my book through) the other day and it was an offer I couldn't pass up. We had a phone meeting and put together a plan for a new idea, which was something that was close to my heart...Scrapbook supplies. I'm so thrilled to be asked to do this job. I've always LOVED their magazines and books and now I get to help with their Craft Junction site. Each month I am given a list of companies to pick from. I then select my top favorites and for this month, you can find them here. It's the perfect job for me, because I'm obsessed with anything scrapbook! Each month I'll get to work with these supplies and share how I used them. Which again... is so exciting! To kick off the site, here is a coupon for 20% off. I just love coupons!!! Don't you? 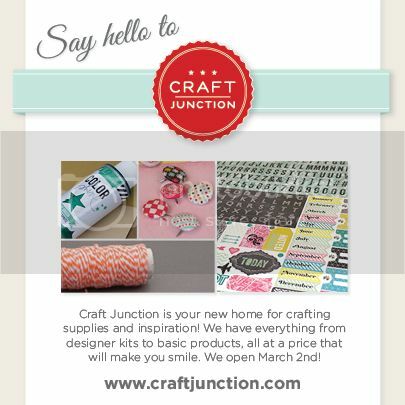 Right now The Craft Junction is trying to reach 5,000 fans on Facebook, for their BIG opening today. Simply go here, like them and you will be entered in for a prize. Even more fun right?! I feel so honored to have been asked to help with this and I just know you will love their kits. So go and check it out now, because it's easy and delightful to use! Woohoo! Off to check them out! Congrats! I just like them on FB! Congrats! Off to check it out!